Owner, breeder, and trainer, Kyle Warren, of Paint River Llewellins, has been professionally training dogs since 1996. He works with all breeds of dogs and people to build relationship fundamentals and to strengthen utility such as: upland bird hunting, waterfowl hunting, search and rescue area search wilderness area search & tracking/trailing, detection, and protection work. Kyle has extensive experience with dogs on many levels. Twenty years of access and experience with a family-run pet food and supply store have made him well versed in canine nutrition, along with his years as a veterinary technician in both private and emergency practice. Kyle’s livelihood is as a professional dog trainer. He has educated more than 3,500 people, trained 4,400 dogs encompassing 100 breeds. Kyle works with people and their dogs with: relationship fundamentals of basic & advanced obedience, rehabbing aggressive behaviors, problem solving undesired behaviors, upland bird and waterfowl hunting; search and rescue in: area search; both live-find and cadaver, tracking / trailing. With a life dedicated to dogs such as Kyle’s— you can find comfort in having a trusted resource that is selectively breeding, raising, and training Llewellin Setters for both the preservation and advancement of this marvelous breed. PRL does advanced genetic testing with Embark Veterinary and uses the ICB Breeder Tool to maximize our selection for the next generation. We test for over 160 different genetic disorders, inbreeding coefficients, homozygosity, cross referencing mean kinships for relatedness, and much more! PRL are incredibly strict with our high standard of early development natural ability. We are selecting pups that will be the ultimate natural grouse dog with the least amount of work! Strong pointing instinct; illustrating staunchness from the get go. A very cautious nature the moment they hit bird scent. Cooperation and keeping tabs on the handler (hunting for the gun), with no more than a moderate degree of independence. Strong desire to retrieve with no pressure just encouragement. Raised in a family home setting to assess character with all aspects of sociability. All of these behavior and performance assessments are completed no later than the start of the pup’s first hunting season. PRL gets all breeding prospects hips certified between seven and nine months of age. At at seven months of age OFA has a 96% chance of recording the same rating at over two years of age. We also do PennHip certification which can be done as young as four months of age but we wait to do both together in our preferred window. For the pups that have satisfied all the tests both: health and performance up to this point the final assessment is on wild birds, namely, the ruffed grouse. If they have a highly productive first season and have passed all testing then they will be added to the breeding program to further assess their breeding quality potential. Our dams’ happiness, health and hunting careers come before their breeding careers. Here at Paint River we put the dogs first, not the buyer or the business, and by doing so we believe everyone involved benefits. As a responsible breeder and trainer of quality working dogs I feel it is my duty to urge all people looking for companion-only dogs versus hunting-family dogs, to support one of your local shelters and find a dog in need of a home to adopt that is a great fit for your household. There are hundreds of thousands of dogs who need homes in shelters across this country alone. While I bring many dogs into this world I feel very strongly that if your future dog is not going to be a working dog doing what the breed was bred to do as a dog lover it’s your duty to look after our shelter dogs that deserve a loving home. While Paint River Llewellins are bred to be great family dogs that is one side of the coin. The other is their workability that is unparallelled. So when looking at a long term commitment such as this please think wisely for both yourself and all the homeless dogs out there. For me, my Llewellins are poetry in motion that provide me with tremendous joy in watching them utilize their instincts that have been bred into them for over a century and with such a team spirit. This just puts me in awe of them. To top it off they are the main reason our dinner is on the table that night after our hard day’s work. So even though my llews snuggle with me in bed and pal around all over the place with me— think of a shelter dog when you think companion dog. 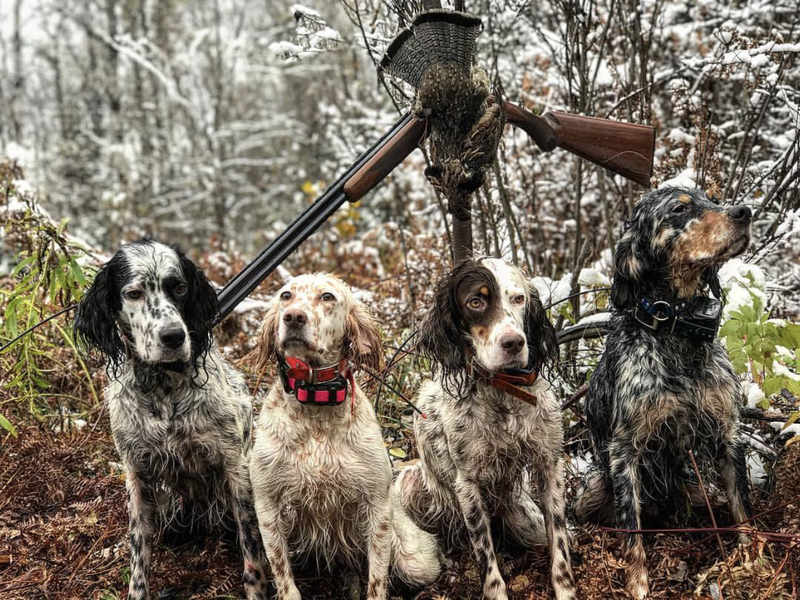 Think of a Llewellin Setter when you think hunting-family dog.